We have seen that when , , and there are two co-existing period-1 attractors in - phase-space. The time-asymptotic trajectory of the pendulum through phase-space converges on one or other of these attractors depending on the initial conditions: i.e., depending on the values of and . Let us define the basin of attraction of a given attractor as the locus of all points in the - plane which lead to motion which ultimately converges on that attractor. 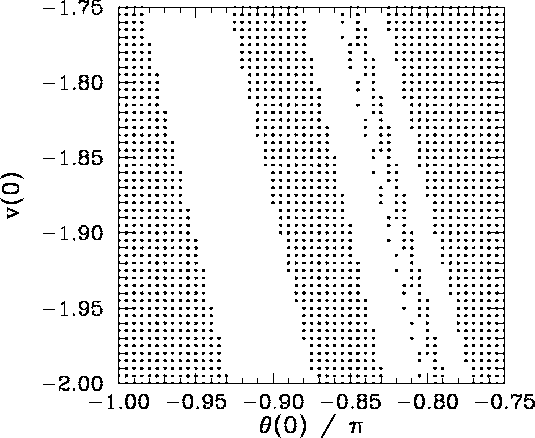 We have seen that in the low-amplitude (i.e., linear) limit (see Sect. 4.2) there is only a single period-1 attractor in phase-space, and all possible initial conditions lead to motion which converges on this attractor. In other words, the basin of attraction for the low-amplitude attractor constitutes the entire - plane. The present case, in which there are two co-existing attractors in phase-space, is somewhat more complicated. Figure 35: The basins of attraction for the asymmetric, mirror image, attractors pictured in Figs. 32 and 33. Regions of - space which lead to motion converging on the left-favouring attractor shown in Fig. 32 are coloured white: regions of - space which lead to motion converging on the right-favouring attractor shown in Fig. 33 are coloured black. Data calculated numerically for , , , , and . Figure 35 shows the basins of attraction, in - space, of the asymmetric, mirror image, attractors pictured in Figs. 32 and 33. 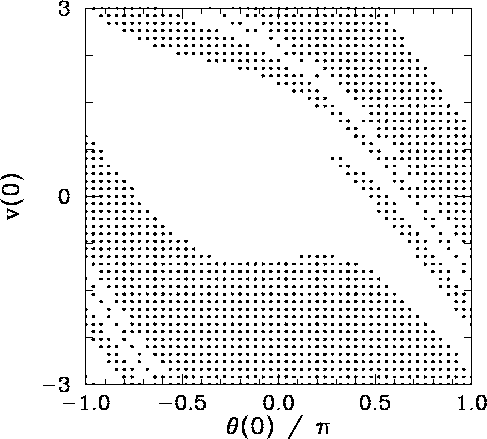 The basin of attraction of the left-favoring attractor shown in Fig. 32 is coloured black, whereas the basin of attraction of the right-favoring attractor shown in Fig. 33 is coloured white. It can be seen that the two basins form a complicated interlocking pattern. Since we can identify the angles and , the right-hand edge of the pattern connects smoothly with its left-hand edge. In fact, we can think of the pattern as existing on the surface of a cylinder. Figure 36: Detail of the basins of attraction for the asymmetric, mirror image, attractors pictured in Figs. 32 and 33. Regions of - space which lead to motion converging on the left-favouring attractor shown in Fig. 32 are coloured white: regions of - space which lead to motion converging on the right-favouring attractor shown in Fig. 33 are coloured black. Data calculated numerically for , , , , and . Suppose that we take a diagonal from the bottom left-hand corner of Fig. 35 to its top right-hand corner. This diagonal is intersected by a number of black bands of varying thickness. Observe that the two narrowest bands (i.e., the fourth band from the bottom left-hand corner and the second band from the upper right-hand corner) both exhibit structure which is not very well resolved in the present picture. Figure 37: Detail of the basins of attraction for the asymmetric, mirror image, attractors pictured in Figs. 32 and 33. Regions of - space which lead to motion converging on the left-favouring attractor shown in Fig. 32 are coloured white: regions of - space which lead to motion converging on the right-favouring attractor shown in Fig. 33 are coloured black. Data calculated numerically for , , , , and . Figure 36 is a blow-up of a region close to the lower left-hand corner of Fig. 35. It can be seen that the unresolved band in the latter figure (i.e., the second and third bands from the right-hand side in the former figure) actually consists of a closely spaced pair of bands. Note, however, that the narrower of these two bands exhibits structure which is not very well resolved in the present picture. Figure 38: Detail of the basins of attraction for the asymmetric, mirror image, attractors pictured in Figs. 32 and 33. Regions of - space which lead to motion converging on the left-favouring attractor shown in Fig. 32 are coloured white: regions of - space which lead to motion converging on the right-favouring attractor shown in Fig. 33 are coloured black. Data calculated numerically for , , , , and . 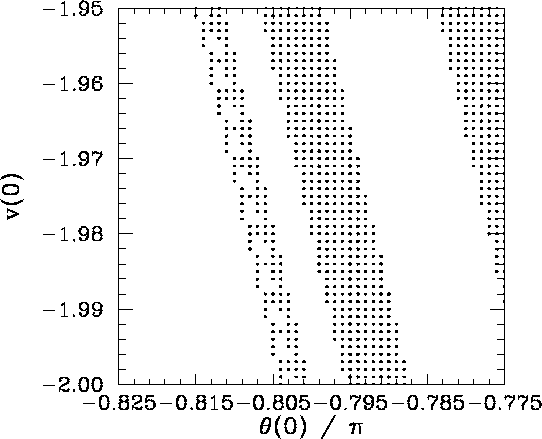 Figure 37 is a blow-up of a region of Fig. 36. It can be seen that the unresolved band in the latter figure (i.e., the first and second bands from the left-hand side in the former figure) actually consists of a closely spaced pair of bands. Note, however, that the broader of these two bands exhibits structure which is not very well resolved in the present picture. 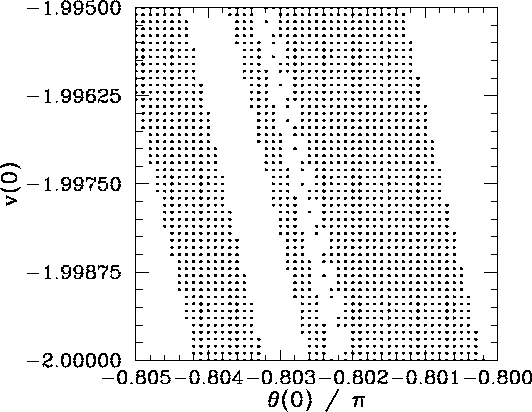 Figure 38 is a blow-up of a region of Fig. 37. It can be seen that the unresolved band in the latter figure (i.e., the first, second, and third bands from the right-hand side in the former figure) actually consists of a closely spaced triplet of bands. Note, however, that the narrowest of these bands exhibits structure which is not very well resolved in the present picture. Many people think of fractals as mathematical toys whose principal use is the generation of pretty pictures. However, it turns out that there is a close connection between fractals and the dynamics of non-linear systems--particularly systems which exhibit chaotic dynamics. We have just seen an example in which the boundary between the basins of attraction of two co-existing attractors in phase-space is a fractal curve. This turns out to be a fairly general result: i.e., when multiple attractors exist in phase-space the separatrix between their various basins of attraction is invariably fractal. What is this telling us about the nature of non-linear dynamics? Well, returning to Fig. 35, we can see that in the region of phase-space in which the fractal behaviour of the separatrix manifests itself most strongly (i.e., the region where the light and dark bands fragment) the system exhibits abnormal sensitivity to initial conditions. In other words, we only have to change the initial conditions slightly (i.e., so as to move from a dark to a light band, or vice versa) in order to significantly alter the time-asymptotic motion of the pendulum (i.e., to cause the system to converge to a left-favouring instead of a right-favouring attractor, or vice versa). Fractals and extreme sensitivity to initial conditions are themes which will reoccur in our investigation of non-linear dynamics.